An Israeli spy satellite designed to scout enemy military activity in the face of darkness and poor weather was successfully launched aboard an Indian rocket Monday during a mission shrouded in a veil of secrecy. The covert payload, wrapped inside the nose of India's Polar Satellite Launch Vehicle, lifted off at 0345 GMT Monday (10:45 p.m. EST Sunday) from the Satish Dhawan Space Center on Sriharikota Island off India's east coast, Indian news reports said. The 146-foot-tall rocket's four stages propelled the booster into orbit, and the TECSAR satellite was cast free of the PSLV's upper stage as planned about 20 minutes after liftoff. Officials declared the mission a complete success, achieving an elliptical orbit with a high point of 360 miles, a low point of 280 miles and inclination of 41 degrees to the equator. 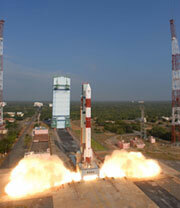 Israeli and Indian government agencies made no official announcement of an imminent launch prior to Monday's mission. A report last month indicated the flight was postponed several months due to concerns voiced by U.S. political leaders, but Indian officials immediately quashed those claims, blaming the delays on technical glitches. TECSAR is fitted with a large dish-like antenna to transmit and receive radar signals that can penetrate darkness and thick clouds. Built by Israel Aerospace Industries, the roughly 700-pound satellite is the first such spacecraft for the Israeli government. Space-based radar payloads allow intelligence analysts access to fresh imagery 24 hours a day, no matter the weather conditions. Also called Polaris, the satellite joins a fleet of Israeli optical reconnaissance satellites that can resolve ground objects as small as two feet. TechSAR's X-band radar system is believed to have a maximum resolution below four inches, according a report in the Jerusalem Post. Previous Israeli news reports said the new satellite will help keep tabs on military activity inside Iran and Syria.